When younger, watching animation, great animation, music, characters and voice acting were prime attractions and appreciated. Whereas as an adult, where my love for animation was even stronger, more components were noticeable, with more knowledge was garnered of behind the scenes and of the different studios, animation styles and those involved. Grew up with 'Ducktales' and always did consider it a personal favourite. Actually like it even more and that is very high praise when some past favourites are far from it now. By today's standards, it is funnier, even more entertaining finding even more to like and from getting much more the references, humour and dialogue, not admittedly always the case when younger. That has been the case with many animated shows re-visited recently, with prime examples being 'Animaniacs', 'Pinky and the Brain' and 'Tiny Toon Adventures'. 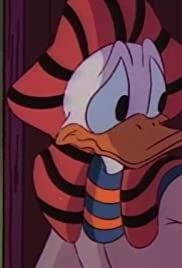 "Sphinx for the Memories" is not one of the best 'Ducktales' episodes, some of the supporting characters are more memorable than others and there are a few moments that were to me reliant on convenience (like with "The Garbled One" headdress), but it is still very enjoyable and interesting in a few ways. One of the episodes actually that fared better as an adult. Everything else pretty much fares strongly. The animation as expected, some lack of finesse in drawing aside, is very vibrant, fluid, clean and the attention to detail in the backgrounds is also note-worthy. One of my main reasons for loving the show has always been the music, the score is dynamic, beautifully orchestrated, never jarring with the action and full of energy. Disney had many theme songs that were difficult to resist and were very catchy to the extent one doesn't forget them, and that for 'Ducktales' to me was one of the best. The writing is extremely funny with some really clever and surprisingly fresh references that were not hard at all to get. Quantity-wise, "Sphinx for the Memories" doesn't go too crazy on them either. It too surprisingly, and rightly, plays the mummy unravelling straight which allowed the emotion to resonate. The story is energetic and thrilling, the Ancient Egyptian setting put to very effective and imaginative effect. Making for genuinely suspenseful and surprisisingly, for 'Ducktales', spooky moments (like Donald's truly creepy possession). The antagonist was suitably menacing and it was interesting that the subject is a more serious/dramatic one for the show, with everything with the perils that did have a sense of danger that one doesn't expect. All the regular characters are on top form but here it is Donald, with a different (who knew Donald could be so ruthless?) side to him as "The Garbled One" that was interesting but also slightly disturbing, that steals the show. Appropriate as it is essentially a Donald-centric episode. The voice acting can't be faulted with Tony Anselmo being especially good.